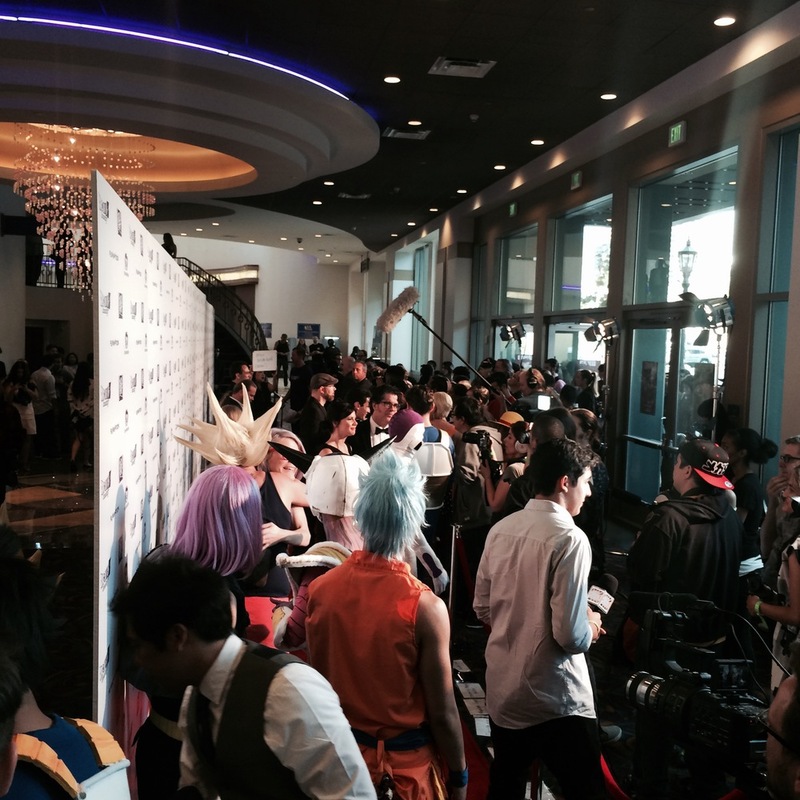 Christopher Sabat at the Dragonball Z: Resurrection F premiere in Los Angeles. This weekend, in addition to all the craziness at Anime Expo, I also had the opportunity to attend the premiere for the film Dragonball Z: Resurrection F. For those of you that have made it this far, Dragonball is a Japanese animated series centered around the combat, exploding planet, and eating adventures of a kung-fu manchild named Goku. The series has been revived in Japan, beginning with this series of films. I hung around the red carpet and snapped pictures of the superfan cosplayers and voice actors. So, at a red carpet, someone writes the name of the actor before and flashes the press off-screen, so they know who they’re taking pictures and video of. Look at that whacky press crowd! This is my temporary tribe. However, this is Christopher Sabat, who voices Vegeta. A fan favorite. I stood right next to the voice of (older) Gohan. I said hi. He was nice. They also allowed some superfan cosplayers. They had a little fan section in the theater. As for the movie, I bought a popcorn and a Coke Icee. Funimation actually gave the press great seats. Usually the press have to stand or something…. We are the great unwashed. On either side of the center seating section, they put the fans. So to keep energy high, this 20-something woman who was really into DBZ was walking around, asking people questions, because many people seated an hour before the premiere. And she wanted to start a Goku vs. Vegeta debate. And then the woman invited people to counter that, come down to the mike, and this normal looking boy takes the mike. And he says, “Vegeta raised his children.” And that’s it. You could’ve heard a pin drop in that theater for several seconds. It was hilarious. The debate ended there. As for the movie, it was very DBZ, that is to say, lots of shouting and punching and very few feelings, but I had a fun time. I haven't seen DBZ in quite some time, and I hadn't seen the previous movie at all, but that did not stop me from enjoying myself surrounded by so many fans thrilled to be there. Also, Hot Topic ran a photo booth inside the theater, and I had this terrible photograph taken to immortalize my trip to the DBZ: Resurrection F English Dub Premiere. I think it's over... the moon. Just kidding. It's over 9000.